Welcome to Seattle Virtual ATC! A fun sense of realism in flight simulation. We want you to tell us how you like the site so far! Please click above. The above pages are for current controllers only. Read below to join our team! Simply stated, the primary purpose of the ATC system is to A) provide a realistic environment for pilots flying on the server, and B) to provide for the safe, orderly, and expeditious flow of air traffic operating in the SVATC multiplayer flight server. All SVATC certified Air Traffic Controllers have demonstrated the knowledge required to independently manage air traffic for their rated positions, and all the positions below their rating. This is important because SVATC operates in a "top down" structure, similar to most other flight sim groups, in which a controller has jurisdiction over all the aircraft operating in his control position, as well as any underlying control positions. For example, an approach controller and a ground controller is online. Approach will also handle tower operations, as well as ground/clearance at satelite airports, and ground will also handle clearanace delivery operations at his designated airport. Controllers here are also a key part in the flight training process, in which many lessons in our flight training program may require ATC services to complete lesson requirements, or to get the full experience of the training session. Controllers on SVATC also help with the administration of the server by ejecting unruly players, reporting unsafe pilot actions to our Safety Management System (SMS) program, and helping to uphold a professional atmosphere. Training to become a controller on Seattle Virtual ATC will be a very rewarding experience for people of all experience levels, in that you will learn more about aviation, see what it's like on the "other" side of the mic, and allows people with real world experience to improve their repertoire. To begin the process, simply send out an email to atc@seattlevirtualatc.org to open up a training request. Please include your SVATC username, real name. An instructor will then add you to an appropriate training course generally within 24 hours. Previous SVATC website registration and approval required. All general knowledge training will be completed online. All one-on-one instruction will be accomplished on our Teamspeak 3 (voice communication) server. If you need assistance, don't hesitate to contact an instructor. Training for clearance/ground will usually take 3-5 hours for somebody with little prior knowlege before taking the written exam. An applicant must pass the written exam with 70% or greater before "dual instruction" on frequency. Simply send an email to atc@seattlevirtualatc.org with your SVATC username and real name to be added to our online training courses. You may also talk to an instructor personally in teamspeak to complete the registration. Previous SVATC website registration is required for manual validation of accounts. How difficult is your ATC training? This answer will vary depending on your experience level. Obviously the more experience you have the easier it will be. We like to tell our new students that they will be treated as a college freshman regardless of their actual age. This "college freshman" mentality provides the basis for a consistant, manageable difficulty level, where it's detailed enough to provide a high degree of realism, but not overly difficult or complex. The first step is the Clearance Delivery rating. Those who have little prior experience can usually pass the written test in less than 5 hours. You will generally see greater content density as your progress through the knowledge portion of each subsequent rating. For those coming in with prior experience, the process should be fairly straightforward, and can get you certified in as little as a 30 minute briefing, and a few hours of on frequency instruction, given a good score on the written test(s). This may vary person to person, and on your previous experience levels. Can I use this in the real world? All of the training gained from SVATC (both pilot and ATC) shall be used for flight simulation use only. We are not affiliated with the FAA or any professional educational institution. However, you are more than welcome to add your experience here to your personal resume when applying to colleges or aviation jobs. How does your "Top Down" structure work? The term "Top Down" generally refers to the controller heiarchy in which a controller assumes jurisdiction over his active position, and all unstaffed positions below it. For example, somebody logged into the server as a local (tower) controller will also have jurisdiction over the ground and clearance delivery positions. Likewise, if one controller is logged in as an approach and another is logged in as ground at the primary airport, the ground controller will be working both clearance and ground at the primary airport, while the approach controler will cover the entire TRACON airspace, tower control at the primary airport, and all ATC positions at satellite airports workload permitting. The term "workload permitting" is also important in that the controller may handle it certain ways. If there is a large traffic rush at the primary airport, and one aircaft at a satelite airport, he may instruct the aircraft to taxi and takeoff on its own. If there are multiple aircraft moving on a satellite airport, the radar controller will likely give a slight delay to one of the aircraft to ensure separation. Do you provide service outside the Seattle area? Yes. We frequently staff airspace outside of the Seattle TRACON, particularly Portland and Spokane areas, or any small airport within the ZSE (Seattle Center) airspace. 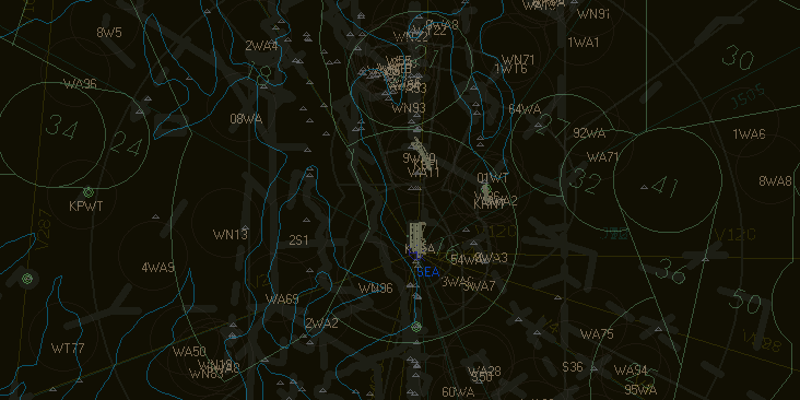 We may occasionally go outside the ZSE coverage area in single night events, or week long "getaways" where we feature other airspace in the United States. In the future as the community grows larger, we may transition north into Canadian airspace, or expand to Salt Lake City Center or Oakland Center. Do you offer a simulation of Flight Service Stations (FSS)? Not at the moment, however we are currently in the early stages of developing an FSS training guide for interested persons to begin training in FSS operations. This will focus on giving pilot weather briefings, coordinating with ATC for flight plans, and more. Functionality for FSS is already being built into our in-house ATC software. Feel free to ask an instructor via teamspeak, or send us an email! We'll be happy to help you out.